I’ve got a serious sweet tooth. More than just one, I’m pretty sure all my teeth crave sweets as proven by my numerous fillings. When my girlfriend and I were invited to attend a special six-course dessert tasting hosted by Chef Judy Lai from Silk Cakes, I jumped at the opportunity. Initially an accountant working with SONY Music Publishing, Judy didn’t get her hands doughy until she made a cake for her niece’s first birthday which everyone went crazy about. She decided to take a chance and enrolled in night classes at the French Culinary Institute, now known as the International Culinary Center. After earning her diploma in Classic Pastry in 2006 she began working at the school’s distinguished L’École Restaurant. She did so well she was promoted to Cake Decorating Instructor. In 2009, Judy opened Silk Cakes in Forest Hills, Queens. The youngest of four girls, Chef Judy is a first generation Chinese-American born on the Lower East Side. 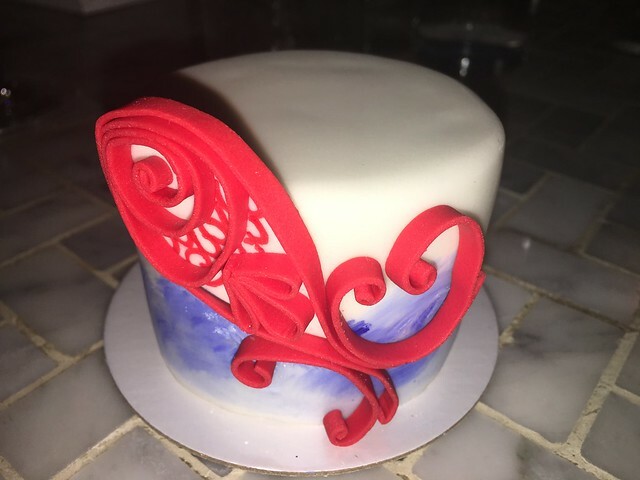 Fully American and yet markedly Asian, she started Silk Cakes to bridge these two identities, working to maintain the Asian traditions of the past in the new, modern format of her cakes in both design and flavor. 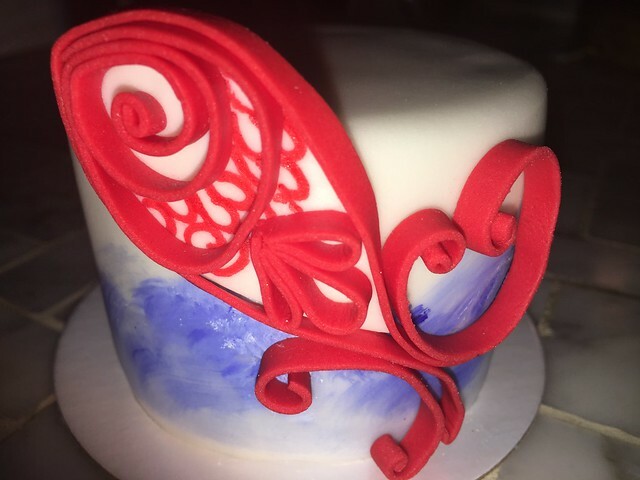 Now let’s talk about Chef Judy’s cakes! 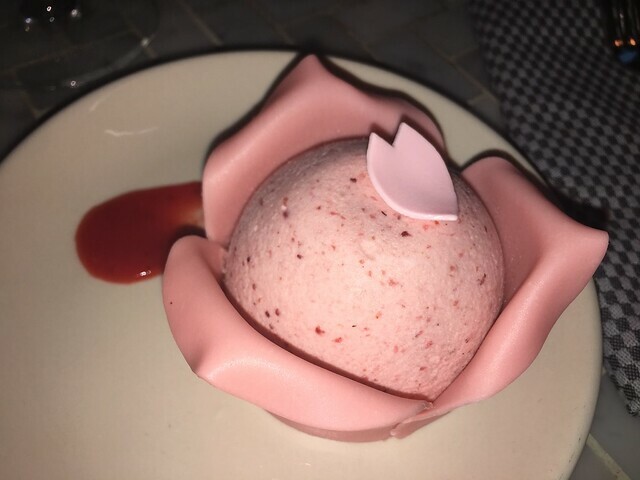 First up in our special six-course dessert tasting was a Sakura Blossom Cake. 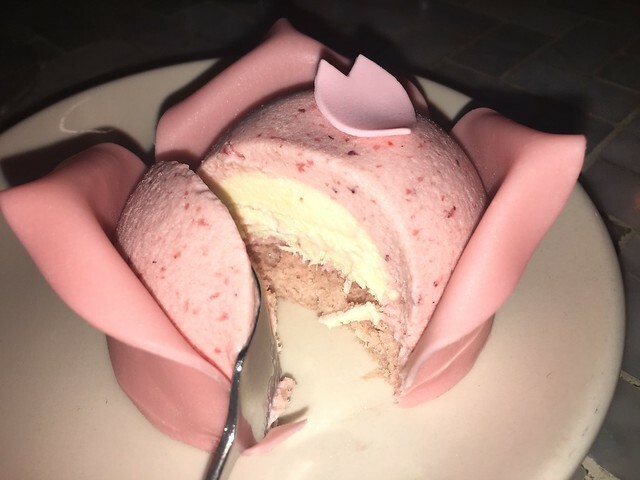 It is Sakura Blossom chiffon topped with layers of white chocolate and strawberry mousse, embellished with handcrafted pink chocolate petals. Light and not overpoweringly sweet, it was absolutely delicious. 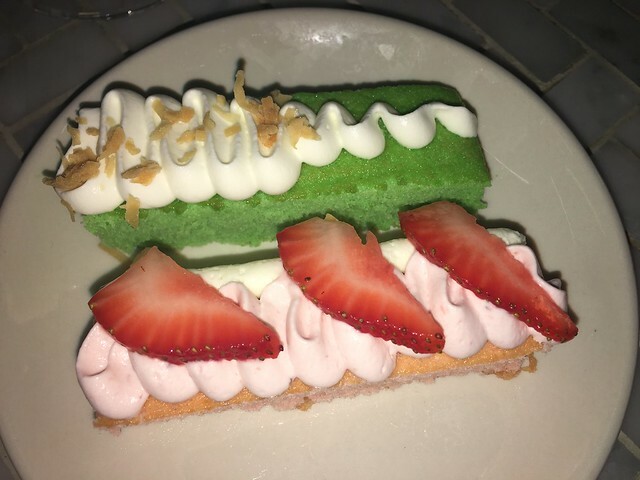 Following that were two of her Chiffon Cakes – one a pandan with coconut whipped cream and the other strawberry with strawberry chantilly cream. I can’t truly describe how good they were, you’ll just have to go try them yourself. We then took a short break from the sugar rush and had a glass of wine to settle down, talking with the other guests. Substantially mellowed we were prepared for the next course which were a trio of Mini-Cupcakes. The Thai tea cupcake with condensed milk buttercream and white chocolate truffle cupcake were excellent, as was the green tea cupcake with blueberry buttercream and semi-sweet chocolate truffle, but my favorite was the black sesame cupcake with peanut butter buttercream and semi-sweet chocolate truffle, since I’m a sucker for anything with peanut butter in it. The only thing missing was an ultra-cold glass of milk! After devouring the mini-cupcakes our fourth course was brought out. It was an Almond Cookie Crust Cheesecake with crème fraîche glaze. OMG – this woman is DANGEROUS! 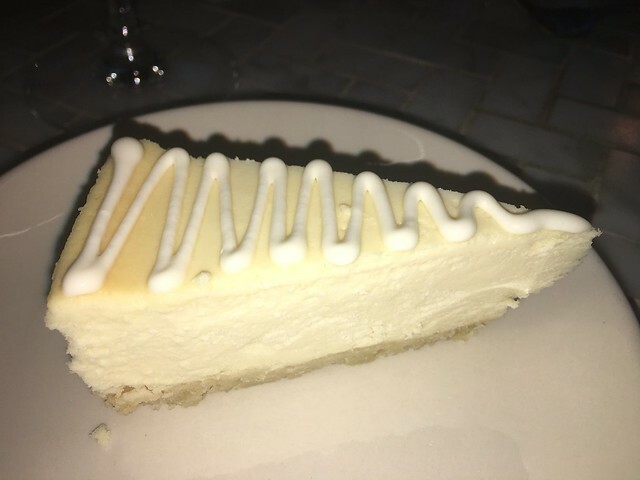 The cheesecake was fabulous, and I’m a born and bred New Yorker who knows his cheesecake. She’s giving Junior’s in Brooklyn some serious competition. 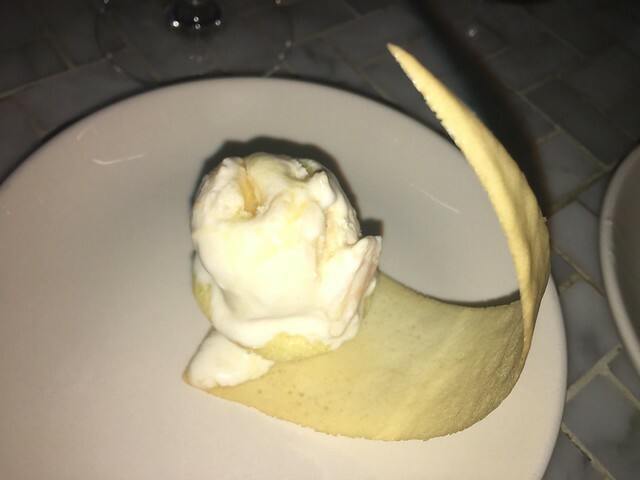 Next up was a mini ice cream cupcake made with lychee ice-cream with Kalamansi glaze on top of a Yuzu cake. I’m not a huge fan of lychee, but my girlfriend loved it. With my teeth now sufficiently sweetened and my heart racing from my sugar high, I relaxed with another glass of wine. Chef Judy brought our next and final course out, a Handpainted Cake of chocolate with green tea buttercream and semi-sweet chocolate truffle. The handpainted Asian watercolor design featured a blue water and red fish, which symbolizes good luck, good fortune, and wealth – all which I could surely use. 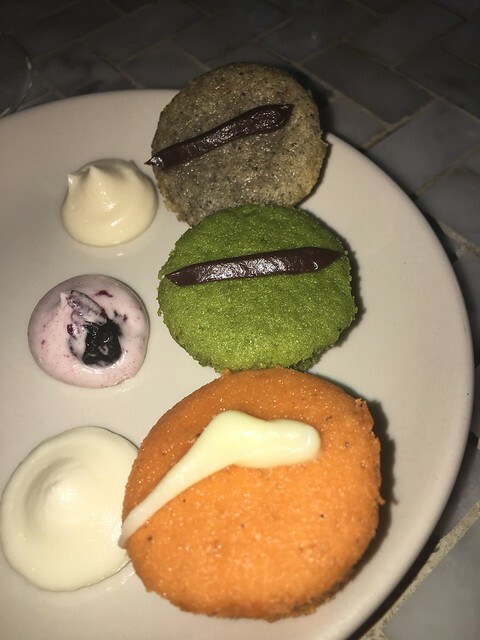 She gave each of us a mini-cake for us to take home as it would have been too much for even a 12-year-old sugar fiend to handle at one sitting. As I’m writing this several days after the tasting I can tell you that the cake was damn delicious. If you’ve got a sweet tooth like I do then this is definitely the place to go!